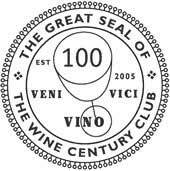 Back in 2005 I became a member of The Wine Century Club. This is hardly an achievement, but it fits my high geek-level. It is a loose-knit (that's an understatement!) group of wine lovers who have tried at least 100 different grape varieties. Considering most wine consumers rarely deviate from their typical encounters with Chardonnay or Merlot, this is going to be a small group. It actually doesn't require über-geek classification to qualify, so long as you pay attention to the wines you drink and occasionally seek out unusual wines in order to expose yourself to new possibilities. What better reason could there be to drink wine, anyway? There's no sense in lying about it either, because you don't win a prize for having tried 100 different varieties (though you do get a hilarious certificate of membership--suitable for framing, of course). I think The Wine Century Club does a wonderful thing for wine, in that it encourages wine lovers to try new wines (if they are interested in being involved with such a thing). The group of people who are interested in it are incredibly fun, because they find wine FUN, which negates any exclusiveness one may associate with wine (or with a club of people who've tried over a hundred grape varieties). There are even some local "chapters" of The Wine Century Club around the country: people get together to share some wine, and if you bring an off-beat wine, great, if you bring a Chardonnay, that's great too. And you don't need to be a member to attend. In fact, no one I know who has downloaded the form and filled it out would EVER exclude a non-member of the Wine Century Club from anything to do with wine, because we all want YOU to come share WINE with US. The man behind The Wine Century Club, Steve De Long, also created an ingenious table of grape varieties based on the layout of the Periodic Table of the Elements (the cunningly titled Wine Grape Varietal Table). If you are into wine but just learning, it can help serve as a basis for understanding your favorite wines. If you are already very experienced with wine, it can provide a solid reference for and reminder of the nature of the grape varieties that we so quickly take for granted. You might guess that I have this item already, but I also bought a fabulous map of the wine regions on the Iberian Peninsula. De Long has also prepared a map of California, which I will purchase alongside a pending map of Italy, which I am eagerly awaiting (because for a while there things were changing in Italian wine legislation as fast as Silvio Berlusconi changes teenage lovers, and I couldn't keep up). I have no financial interest in these things, by the way--just an interest in sharing the work of a man whose perspectives on wine are not common enough. Check it out--drink some more wine, and join the club. I met Scott Palazzo a bit more than a year ago, when he visited Ohio to plug his wine. We had a blast tasting his wine and shooting the breeze. He has this great mane of silver hair, and history as a vagrant in Bordeaux in his early twenties. As I recall he used to be a producer in the music business, and directed some music videos, among other things, so in all, a very interesting guy. 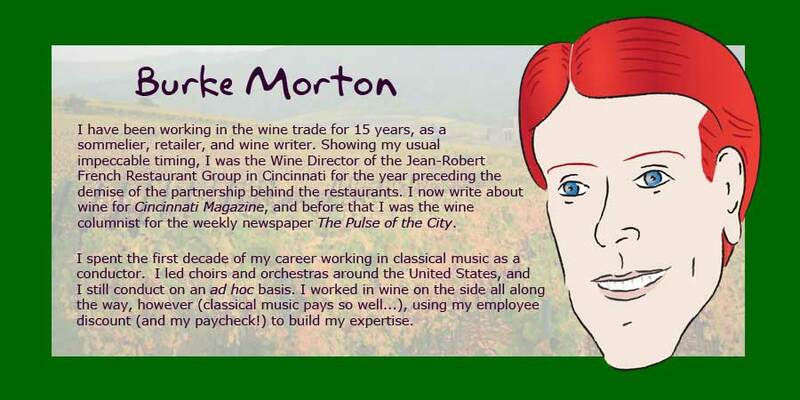 We didn't actually talk about the wine as much as we did other things (no doubt because of our common musical background) but I did learn enough about his vinous offspring that he achieved his objective. Besides I had already bought his wine because it is sensational. Among the things he told me about his wines (because he does make more than one) was that they are informed by the practices he encountered in St.-Émilion (the Bordeaux appellation famous for Merlot- and Cabernet Franc-dominated wines). I appreciated that he didn't say "Bordeaux-like". You may think me a nitpicker over this, but bear with me: he may say "Bordeaux-like" (or Bordelais, something along those lines) to other people routinely, but on this day perhaps he was bored with that descriptor so he happened to say "informed by" (or maybe it was "inspired by," but that's moot now). Whatever the case, the way he said it to me makes an important distinction, and is a FAR more accurate statement, because it is VERY DIFFICULT (with the exception of cool vintages like 1999) to make wine in Napa Valley that is "Bordeaux-like", largely because it's HOT in Napa Valley, and NOT HOT in Bordeaux. If you've ever watched your garden (or even your grass) grow over the course of multiple summers, you'll know that steady, predictable, warm weather is good for it (though with grapes, you generally don't want rain after a certain period in the growing season, where your garden is always thirsty). Scott Palazzo runs a terrific micro-operation. He produces fewer than 2,000 cases of balanced, graceful wines that are zesty, vigorous, expansive, aloof (seems out of place, I know), and packed with the slutty fruit profile one can only get in California. They are at once rhapsodic and introverted, and the first time I tasted the 2005 Red Wine, I thought of, for some weird reason, Bill Murray's character in Groundhog Day. The evolution of the character in the movie was extreme perhaps, but the wine followed a similar path--it continually took on character, gaining in appeal and depth, while never losing its surface sheen. Palazzo Wines come in two flavors--a Red Wine and a Cabernet Franc. Both are currently from the 2006 vintage. Now that I've checked the website, I see that the Franc is sold out at the winery, but it is in the market, although quantities are limited, so check with your retailer. The Red Wine is available through the website still, and I can tell you that it is a smash. The Best Part? The wines are $60! I know, that's not inexpensive, but they are not $120 like so many Napa Valley trust-fund reds are--and this is a marvelous bargain for the quality in the bottle. I would adjure you to add Palazzo to your list of yearly must-buys. It is well-known that Europe is overrun with wine that suppliers cannot sell, so they have been turning wine into ethanol to power cars. It is a shame that the exhaust from a voiture du vin doesn't smell like wine--now that would change the nature of air pollution. To combat this glut, the EU has taken steps to reduce wine production by mandating the removal of grape vines (essentially clear-cutting vineyards)--a rather draconian requirement, but something must be done! Across Europe vineyards are being pulled up, but this has been particularly hard on France. According to a Reuters article, this poses a serious economic threat to Corsica, the tiny (Italian) island (belonging to France) in the middle of the Mediterranean. Sounds like Corsican wines need a worldwide makeover. Corsican wines? Who cares about Corsican wines? We can hardly ever get them in the U.S! Well, I care about them, obviously. I've had enough of them to know that we are missing something, and besides, more than half the production of wine on the island is ROSÉ, so of course I'm a supporter! This is only touched on briefly in the article, but the reason we rarely see the wines is Corsica's "island status." Exporting wines is the main hurdle that wine estates in Corsica face. From the perspective of U.S. buyers, it causes further trouble, because the wines not only have to get to mainland Europe, but also to a transatlantic port and then to the U.S. That's a lot of shippers that need to be paid. I have heard varying figures (from those who've imported Corsican wines to the US) that shipping costs account for between 20%-25% of the retail price of a Corsican wine in the U.S. It's hard to pass on the shipping costs at the same rate as a Côtes-du-Rhône, for example, because Corsican wine can't command the higher price. Pure economic considerations perhaps dictate that this source of wine should be eliminated altogether except local consumption. I'm sure that's not under consideration, but if the local economics of wine production stop working--which, according to the Corsican winemakers' association, is a possibility with the EU's land-clearing program--then the local wine trade would head in that direction anyway. And that would be a loss. The stories behind the wines--the voices of those who make the wines and those who drink them--would be lost. This is nice and romantic and all, but another reason lies in one of Corsica's native grape varieties, Sciacarellu, which exists only on the island. It tastes like no other grape and it has a marvelous fragrance. That alone creates a different kind of experience, and as so many wines from around the world are tasting very much like each other, a different experience may soon be in short supply. It also offers some wonderful opportunities for use with food, as the unique flavors of this grape (fruit is excellent, but it is not fruity, and it has a slightly thorny--yet not tannic--notion) draw secondary and tertiary flavors out of saltier foods, and these foods in turn enhance the fruit succulence of the wine. There are a handful of Corsican estates that are first rate, but apparently the author of the article didn't encounter any of these at Vinexpo. I would love to see these wines more often in the U.S., but like the arts in public schools, the economics of it dictate that they'll be the first thing to get cut when money is tight.